I produce a range of materials for organizations that are making the world a better place. 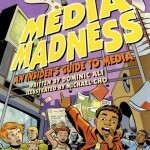 I’m also the author of the award-winning children’s book Media Madness: An Insider’s Guide to Media. If I can assist your organization with its communications or content needs, get in touch! • Work with various stakeholders to craft communications materials such as press releases, backgrounders, and articles. I’ve been a freelance journalist for many years, and have contributed to dozens of media outlets in Canada, the U.S., and Caribbean. I’m working on an 70,000-word comedic young adult novel set in the Caribbean. The Young Adult novel chronicles the misadventures of 17-year-old Andrew Mohammed, the child of Caribbean immigrants. When Andrew lands a summer job in his ancestral homeland as a reporter with the local newspaper, he arrives with two simple goals: fun and a little lovin’. To fulfill his quest he must first survive several culture shocks, adjust to his eccentric newsroom colleagues, and tame his ferocious 73-year-old Granny. Along the way he also discovers something he didn’t expect: himself.